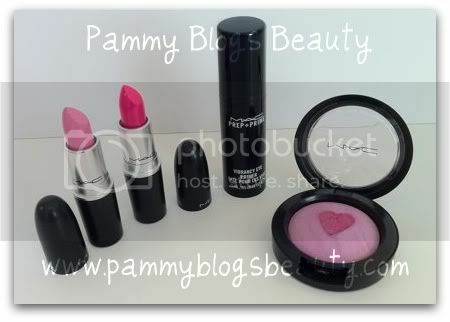 Pammy Blogs Beauty: MAC "Quite Cute" plus Origins Haul: Fun Saturday Shopping! MAC "Quite Cute" plus Origins Haul: Fun Saturday Shopping! VitaZing SPF15 Energy Boosting Moisturizer: Okay, curiosity killed the cat on this one. I have had it on my list forever...and now is the time of year to bust out your tinted moisturizers with SPF. But, I am a little unsure of some of the sunscreen ingredients on this one (my skin is finicky about SPF, so I hope the SPF combo in this VitaZing works for my skin!). @Jennifer-exactly why I wanted to pick it up! But, when you see the swatches (in upcoming post), it wears suprisingly pink (with a purple-ish tone). Unique for sure!!! Does the origins tinted moisturizer come in one colour? I am wondering cause I am pretty fair (like you) and was apprehensive about whether this would suit my skintone. @Nea-Glad to hear that you like the Vibrancy eye primer! My eyes need all the help they can get right now (pollen season where I live). The Candy Yum Yum looks amazing on. Super bright, but I heart it!!! I picked up Candy Yum Yum & In Synch, and then placed an order to grab Naked Liner, Miss Behave and Play Time. I'm curious how the primer compares to TFSI. @Phyrra-Hey Girl! Don't you love this collection! You got some great items for sure. You need to post a FOTD with Sakura ;-) I nabbed that too! @Cydonian-Hey Wendy!!! OMG, Isn't Sakura amazing!!! And, LOL!!! It totally dosen't surprise me that you picked this one up too as you are my fellow purple-lover!!! Too cute to resist, right! xoxo!! !